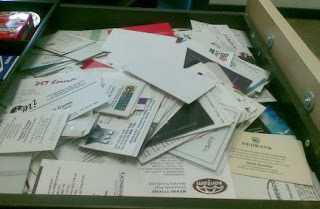 Marcia's blog: What do you do with all those business cards? What do you do with all those business cards? 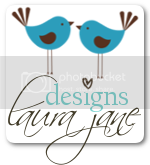 I know you collect business cards at networking events, client meetings, conferences, etc. What do you do with them when you get back to the office? Do you have a plan to process them, or do you hoard them as my colleague does? I want to hear from all business owners, but especially from you, Suzanne and Janet. put them to the left of my keyboard so that they annoy me until I process them. I'm a visual person so I can't stand the clutter! schedule some time (10 minutes or so) to enter their details in Outlook, usually within the next week. I get myself in the mood and just work through the whole batch. throw the cards away! This is critical. Over to you! Please answer my 3 questions. 1. Within a few days of meeting the person, I send an email to remind them who I am and where we met, sending them any information I may have mentioned during our conversation. 2. If it's someone I definitely want to stay in touch with or expect to have referrals for in the future, I enter the details in my Outlook contacts. 3. Unless I expect to pass the business card on to someone, it then gets recycled. Do not throw the cards, instead build a business card wall. It may look nice. 1) Where do you put them? 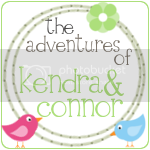 I put them in a three-ring binder that is divided alphabetically. Behind each alphabetical section are card pocket sheets that are business card- sized. They hold 10 cards each. I keep them in this file, and then when someone calls me or asks me for a referral to someone who does the kind of work that my associates do, I look up their name and give the person their phone number. I don't take the cards unless I feel I can refer them to someone. I send an e-mail later if it is appropriate. I let the person know why I'm taking their card if I plan to use it for that reason. If I don't, I just keep it in the binder for my own reference. Polly, what a great system you have and I love that you don’t take cards unless you know you can refer them! Joyce, I find that if you schedule time for just after the event, it's more likely to get done. Great system too. Goals - are you hooked yet? Is writing articles a part of your marketing?